BRING BACK YOUR BEST HAIR. 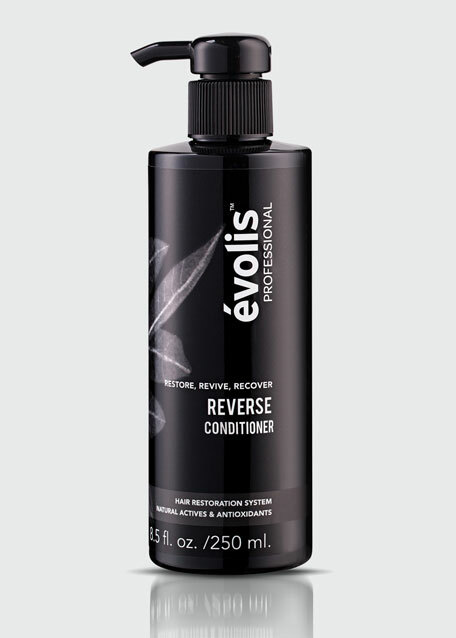 évolis REVERSE Conditioner is the perfect lightweight solution to condition, increase thickness and add shine. Strengthening keratin and wheat protein fortify the hair structure, protect mid-lengths and ends, and add volume. Hair is thicker, fuller, stronger and shinier. Apply directly following REVERSE Shampoo for weightless conditioning. Gently conditions to protect strands while the natural actives work to reverse thinning hair. Lightweight conditioning does not weigh down fine, thinning hair. Improves overall texture and body. Increases hair density; fortifies hair structure against damage or breakage. Transforms texture, condition and overall hair quality within 90 days*. For best results, use in conjunction with the évolis REVERSE Activator and Shampoo. SANGUISORBA OFFICINALIS: A hair-saving flower that is commonly found in the fields of Europe. Part of the powerhouse REVERSE hair restoring blend. ROSA MULTIFLORA: Japanese rose is an important player in the REVERSE hair restoring blend. Harvested in Japan specifically for évolis. SWERTIA CHIRATA: Known for its ayurvedic benefits as an antioxidant and anti-inflammatory. Key part of the REVERSE restoring blend. KERATIN: Deeply penetrates and repairs the hair shaft, improving hair elasticity and strength. Works to protect the hair from future damage, split ends and breakage. ROSEMARY: Known for its antioxidant and anti-inflammatory properties, rosemary supports optimum scalp health. Developed by hair biologists and recommended by hair stylists. Formulated without parabens, sulfates, silicones and phthalates. Color Safe, Keratin Treatment Safe and Extension Safe. All évolis Professional products are 100% cruelty free. 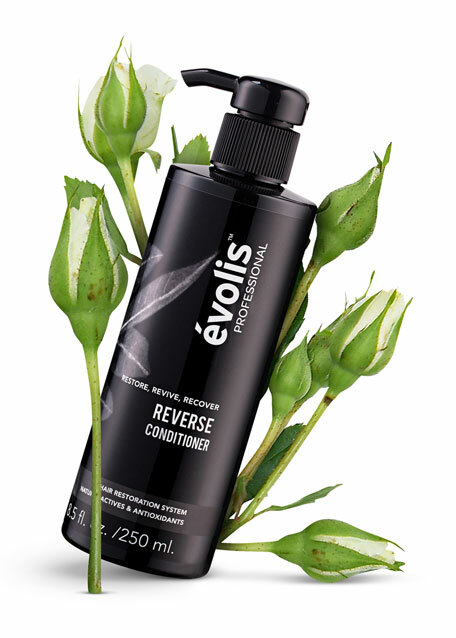 In a consumer experience study 95% of users felt their texture was improved and 9 out of 10 preferred the évolis system to their current hair care regimen*. The évolis Professional products were developed by scientists focused on hair biology; specifically how the FGF5 protein impacts hair. Researchers concluded that an overabundance of FGF5 can negatively impact hair, turning healthy hair into thin lifeless strands and promote an increase in hair loss. By blocking FGF5, the negative effects can be reversed, resulting in the restoration of hair density, promotion of new growth and the preservation of existing hair strands. 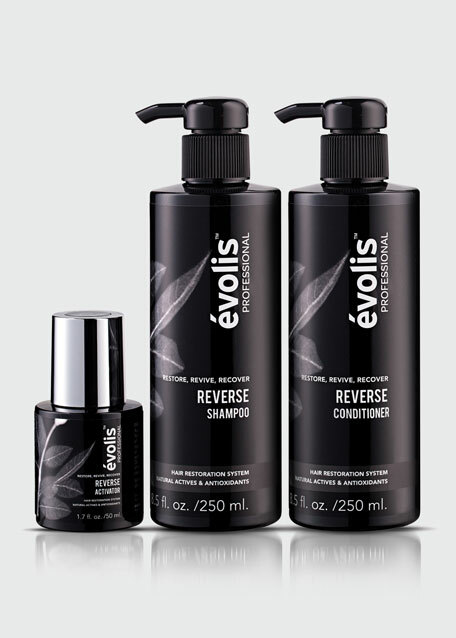 évolis Professional product formulations are based on these learnings and are designed to give you YOUR BEST HAIR. *In a 2017 Consumer Usage Study of 79 users conducted by Colour Collective, Dallas, TX.